Stand up for boxer Mrunal Bhosale. Fundraising to help him with his boxing expenses! 28-year-old Mrunal Bhosale has a Bronze medal at the National championship under his belt, but no steady job to fall back on; he drives a goods carrier in Pune to run his living expenses. He keeps his dreams of an international medal alive and make the country proud someday by competing in international events. The national level winning boxer Mrunal needs your support. 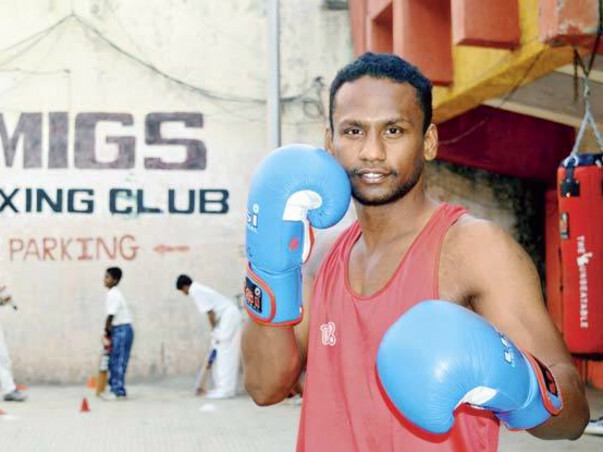 For a long time, Mrunal has been taking up whatever came his way to get some money and keep his boxing dream alive. From selling DTH connections, putting up hoardings on the streets and installing mobile towers on buildings to even being a loan recovery agent, he has done it all. At the Nehru Stadium in Pune, the 28-year-old is known as the champion boxer, but today for everyone else he is just a tempowala. When he finally took up the sport again, four years later, the only thing that kept him going was the hope that he would get some recognition, a job and access to good training facilities, so that he could focus on his first love boxing. Bhosale practises for four hours every day and spends the rest of the time driving a tempo to earn his livelihood. Bhosale makes between Rs 200-500 a day from driving the tempo. “There are days when there are no deliveries and then there are times when I make more money in a single day than I would do in two ordinary ones,” he says, explaining the volatile nature of the business. His coaches have advised him to take nutrition supplements, but his family cannot afford them. The boxer manages on home-cooked food. The club where he practises has no boxing ring, just two boxing bags. The boxers practise on a tar road which they share with aspiring cricketers. There is no changing room either and, while leaving, they pull down the shutter where their kits are stored. He wants to become independent, but until he gets a job driving auto would keep him afloat. Before every competition, he requires money for travel, food, etc. Bhosale’s aim now is to win a National gold, which will give him a chance to represent India internationally. However, he is not sure how long he can keep the fire in his belly burning and fears that if things don’t change, he may be forced to abandon the one identity, of his two, that gives his life meaning. It's time to stand up and help our sport athletes like Mrunal Bhosale. Let’s do our bit to change his life - of all things, sport champions like him shouldn't have to worry about making ends meet. Never Give Up on your dreams. We, Indians are proud of You...Keep it up. All the best Mrunal.... continue to live your dream! !